Hotel Harsha is near T.V. Tower (D.D. Shimla), near Institute of Advanced Study. Hotel Harsha is located near Shimla Railway Station and its feasible location has made the hotel a much sought after holiday retreat for all kinds of travelers. 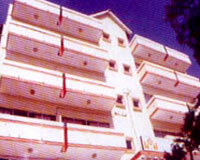 Harsha offers a wide range of modern facilities, coupled with warm hospitality. The hotel is the perfect place to enjoy a comfortable stay. The hotel offers comfortable accommodation in a total of 19 well appointed rooms. The rooms are categorized as Double Rooms, Deluxe Rooms, and Suites. Each room is spacious and airy, providing in-room facilities like hot/cold water, color TV and room service. It has one multi-cuisine restaurant called Kadambari.